Method of measuring the temperature of an oven by the comparison of the colour of a lamp filament and the base of a flame. Inside is a small lamp whose brilliance is controlled by a large knob around the viewing tube. The operator views the bulb and the base of this flame through the tube, turning the large knob until the colour of the flame is the same as the bulb, the temperature is then read from the scale in Centigrade times 100. 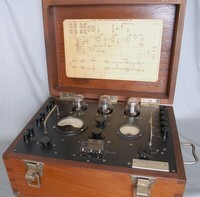 Test meter for GPO engineers with instructions for use. Very basic knob and terminals used with a variety of shunts. Marked on the front label (310506) 4 GPO TRA. 64/10. No more is known at present. 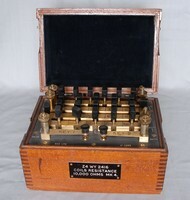 Valve tester used by Maintenance engineers in the Radio and TV trade and others, for checking the working Characteristic's of a valve under operating conditions. 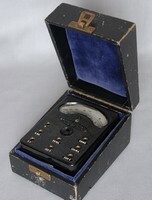 Sound level meter containing 7 sub miniature valves. Used for measuring sound intensity in the range 30 to 130 decibels. Powered by one High Tension and two low-tension batteries. A thermocouple consists of two junctions of dissimilar metals. If the two Junctions are at different temperatures a voltage is produced which, for small temperature differences and accuracy was measured using a potentiometer. To achieve absolute temperature measurement one of the junctions must be kept at a known temperature, often by melting ice. The thermocouple potentiometer removes the inconvenience of having to use melting ice for each measurement by measuring the temperature of the reference junction. The measured temperature can then be corrected to the standard cold junction temperature of 0 degrees C.
An internal lamp sends a beam to a mirror attached to the movement of the meter; the beam is then reflected onto the screen as a vertical line. This makes the instrument very sensitive. 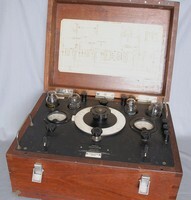 The use of this instrument is to measure magnetic field, and it is known as a "Fluxmeter". A coil is connected to the input terminals and this can be used to measure changes in field strength. This technique pre-dates measurement of magnetic field by nuclear magnetic resonance which is a technique used in archaeological searches. Device for testing batteries, just by lighting a bulb, a good indication of a useful battery because it will test it under load, a bright light would indicate good. Not suitable for chargeable types. 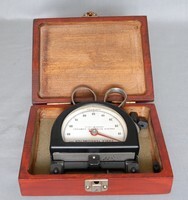 An early current meter was the electrodynamometer of 1881. It was used until the 1920s when it was replaced by the direct reading meter patented by Edward Weston. 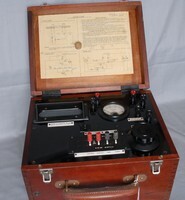 Used in the early 20th century, the Siemens electrodynamometer, for example, is a form of an electrodynamic ammeter, it has a fixed coil which is surrounded by another coil having its axis at right angles to that of the fixed coil. This second coil is suspended by a number of silk fibres, and to the coil is also attached a spiral spring the other end of which is fastened to a torsion head. If the torsion head is twisted, the suspended coil experiences a torque and is displaced through and angle equal to that of the torsion head. 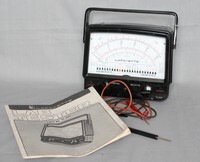 Chart Recorder with Indian ink type pen, used for measuring current, and driven by a 220vac motor. A radiation dosimeter is a pen-like device that measures the cumulative dose of radiation received by the device. It is usually clipped to clothing to measure the actual exposure to radiation. Magnifying lenses (a low-power microscope) and an illumination lens, helps to read the dose by aiming the illumination lens at a light source and looking into the device. For personal use, this is the most useful device to measure radiation, because biological damage from radiation is cumulative. Dosimeters must be periodically recharged. The dosimeter is usually read before it is charged, and the dose is logged, to chart exposure. In many organizations, possession of the recharger is limited to health physicists to prevent falsification of exposures. The unit is not very sensitive,and the scale is not calibrated, the word trainer indicates its nature. This is a companion model, the trainer is used to teach the use of the Radiac Model No2. Item A1300. The range is low so it will detect the weak training sources used to simulate radioactive fallout. See Radiac No2, A1300 for more information. 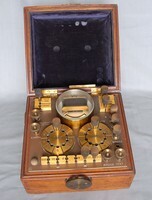 Radioactivity detection unit, produced after the Second World War as a result of the Cold War period. These units were made on instruction from the government, and supplied to all Councils and Military establishments. It was expected that in the event of a Nuclear attack, they would be ready to measure contamination levels. Spare detector head for the contamination meter Item A0513. 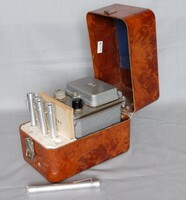 Four pocket Dosimeters and charger unit, inside a Bakelite Case. Used for detection of radiation. The meter can be read while in the carry case and a side flap opens to allow access to the controls. Beta detection is accomplished by removing the base plate and a barrier plate inside. The unit was used by the Civil Defence Post War. Although referred to as Geiger counters, most CD devices were radiological survey meters capable of measuring only high levels of radiation that would be present after a nuclear event. Required 2X 1.5Volt 1X 9Volt and 1X 30Volt Batteries. 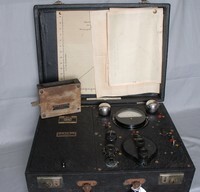 The Radiac Survey Meter No 2 or RSM was a 1955 meter which counted the particles produced by radioactive decay. 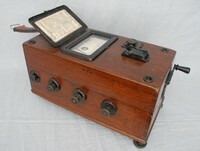 This meter suffered from a number of disadvantages: it required three different types of obsolete batteries, it also contained delicate valves that were liable to failure and it had to be operated from outside the protection of the post. These were favoured as they had been tested on fallout in Australia after the Operation Buffalo nuclear tests, and remained in use until 1982 by commissioning a manufacturer to regularly produce special production runs of the obsolete batteries. Measures down to point 01 of a Roentgen. The calibration source mounted in the cover has been removed for health and safety reasons. Unit used for measuring the strength of radiation over time, not suitable for contamination measurements, this unit will measure the amount of radiation that will be absorbed by coming into contact with the material on test, over one hour. The strength of the object on test is read in Roentgen/Hours, this means that although coming into contact with the object will cause absorption of radiation immediately, its seriousness is only measured if the contact is sustained over a period of time. 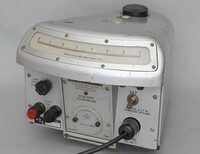 Used to test for radiation leakages on X- Ray equipment. 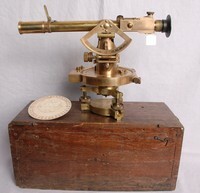 Theodolite dated 1916 with broad arrow indicating it has been adopted for military use. Early Fire detector using a small plastic disk tensioned by a spring, temperatures above habitable conditions will soften the plastic forcing the steel disks together, creating a circuit which could ring a bell or bells. Thermostat for a variety of uses. May have been made for a specific piece of equipment. Early type thermostat using a sealed atmospheric chamber and a very strong spring. Used for measuring an unknown resistance. The Kelvin portion enables reading accurately very low resistance (below 1 Ohm). The Kelvin Bridge makes allowances for the high currents used for measuring very low resistances, as heat generated can cause errors. Used for measuring the specific gravity of Whisky. 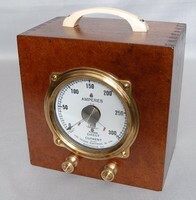 Early moving coil meter in wooden box with wall fixing or stand alone on two adjustable feet. 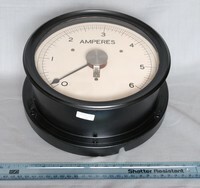 General industrial meter for measuring power sources, with 270 degree scale. 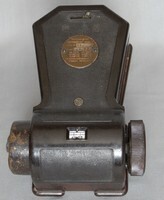 General industrial moving Iron meter for monitoring power sources. 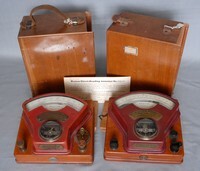 School Laboratory measuring meters, used in demonstration theatres, and before students were trained to use multi meters, when they started to come into use. Amp meter is .5 To 3 amps. 0 To 250 kilovolt meter, for Laboratory and College use, designed to be laid flat, as the terminals are underneath. The calibration certificate for the ammeter is for Serial No 30940 ? The meter shown is Serial No 23602. 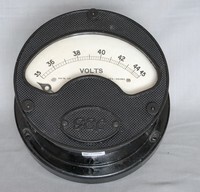 The Voltmeter is dated 13 Jan 1920. British-born American Chemist who revolutionized the Electro-plating industry, founded the Weston Electrical Instrument Company. A prolific inventor who held 334 patents, Edward Weston May 9, 1850 � August 20, 1936 helped revolutionize the measurement of electricity. 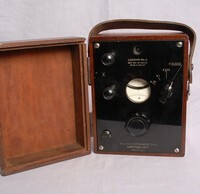 Weston's son, Edward Faraday Weston also received several patents regarding exposure meters. 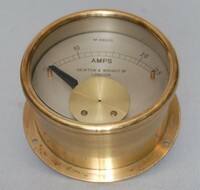 Surface mounting ampmeter for 0-25 amps in brass case. Meter calibrated for measuring direct current up to 300 amps. Requires an external shunt. Hot Wire Ammeters work the expansion and contraction of a piece of wire when heated by an electric current. Although not very accurate and prone to ageing effects of the wire, they were an inexpensive way of indicating currents of over 100 Milliamps. Smaller current versions would have made the wire too fragile. Power moving Iron meter for measuring domestic equipment, volts and amps are measured by inserting this device between the power lead. Plugged into a lamp socket, the appliance was plugged into the meter ,it then measured the current being drawn. Used in the days when household power points were rare if not non existent, and electric irons were plugged into the light fitting. The movement is of the moving Iron type. 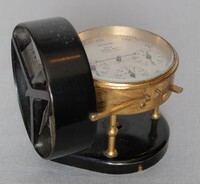 The Pifco 'All in One' Radiometer Measures in three ranges up 30 Milliamps, 6Volts or 240 Volts AC or DC from the same terminals on top of the unit. continuity is also possible for low resistance items such as transformers and valve heaters using the 5 pin valve base on the top of the unit, the reading is not callibrated in ohms. A 1.5 Volt battery fits inside the unit. Price for 7 or 9 pin valve adaptor 3/9d. Price for insulated test leads 3/6d pair. Meter for home workshops, with 5 ranges and 7 terminals, including a top centre terminal. Bakelite fob meter supplied by Curry's. Directions on the box reads:- Place plug on flex in negetive tapping, 8 Volt plug for L.T. & G.B. 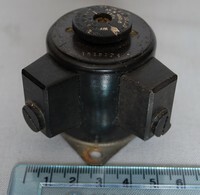 120 Volt plug for H.T. 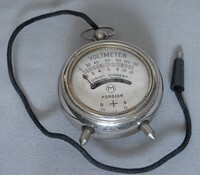 Engineers pocket voltmeter. And the original box. 120 Volts Dc could have been the local mains voltage before 1930. 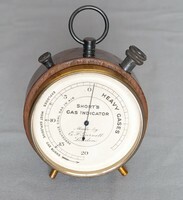 Engineers pocket meter, moving Iron type, which looks like a pocket fob watch. 120 Volts Ac or Dc could have been the normal mains voltage before 1930. 120 Volts DC could be a normal mains voltage before 1930. Substitution boxes are used for temporarily replacing resistors or capacitors that may be assumed faulty, by inserting a known value of a component into a circuit and conveniently adjusting the value if necessary. A bridge for the measurement of, L= Inductors C= Capacitors & R= Resistances. A Bridge is a circuit of 3 Known values connected in a square configuration with the last portion the fourth for the unknown component, when the current across the bridge is at null or balanced the value of the unknown component is the same as its opposite counterpart. The test terminals are located on top of the instrument; the flat top provides a useful insulated platform for supporting the component to be tested. This also has printed basic instructions for use. The Universal AVO meter of 1933 Dated 1938. 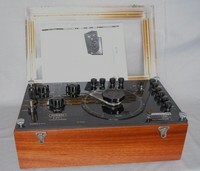 This was the first in the range of these famous instruments, and was replace by the model 40. AVO is well known for it's very solid and reliable measuring instruments, and - coil winding machines. Adaptor for the AVO Model 8 and HR (high resistance) models, for measuring voltages up to 25 Kilo Volts. Adaptor for the AVO Model 8 and HR (high resistance) models, for measuring voltages up to 10 Kilo Volts. 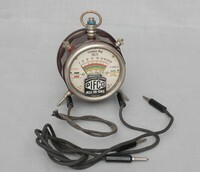 Cheapest of all AVO meters in original case, to change the range you simply re plug the leads. In 1938 the AVO minor cost 45 Shillings. AVO is well known for it's very solid and reliable measuring instruments.this unit was less expensive than the larger models, but unlike the Minor had a switch to change the range. AVO 'Automatic Coil Winder and Electrical Equipment Co'. The model 7 was intended more for electricians and power engineers. 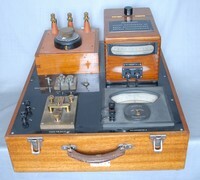 The model 8 was better for bench electronic engineers. 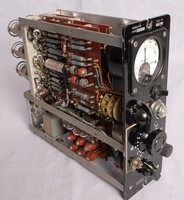 These meters were the classic instrument for test engineers in the radio and TV service industry for many years. 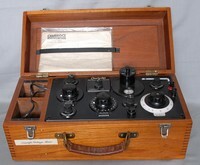 This classic Avometer dated April 1941. At 333 Ohms-per-volt not designed for electronic equipment. It was advertised as a 'Power Engineer's' meter. 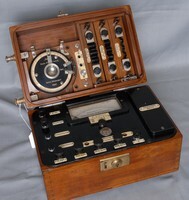 Introduced in 1939 and initially supplied to the Admiralty. 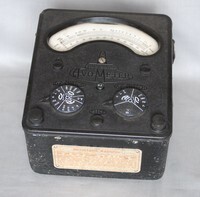 This classic Avometer was introduced in 1939. At 333 Ohms-per-volt not designed for electronic equipment. It was advertised as a 'Power Engineer's' meter. Introduced in 1939 and initially supplied to the Admiralty. Possibly the most popular professional multimeter of the 20th Century, the venerable AVO Model 8 has reached retirement: the final Model 8 have left Megger�s Dover factory, where it has been produced since its introduction in 1951. Last off the line the Mk7. The units are plugged into a receiver between the valve under test, the set is switched on and after a warm up period with the leads connected to a test meter the performance of the valve can be measured. 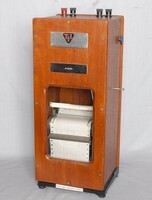 The four and five pin unit in 1923 cost 25 Shillings and the seven pin unit cost twelve shillings and six pence. Useful for testing Military valves as well as commercial types. Basically the 'Automatic Coil Winder and Electrical Equipment Co.', Douglas Street, London SW1. AVO is well known for it's very solid and reliable measuring instruments, and coil winding machines. 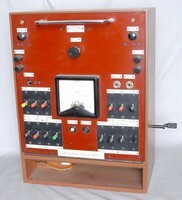 Amateur large scale multi meter, from the 1960's. Uses obsolete battery for high resistance measurement. Developed as a prototype to measure sound pressure levels to evaluate damage caused by Military Jets flying over buildings. New Laws regarding Supersonic aircraft flying over built up areas rendered it obsolete. 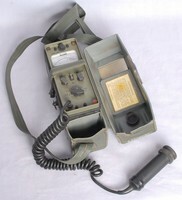 Similar units are now used to measure explosions. Standard Issue GPO engineers tool bag of the period. 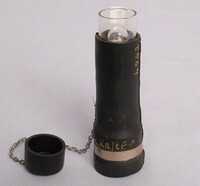 Used for measuring the coal gas content in air by atmospheric pressure, and indicated by the percentage of coal gas. 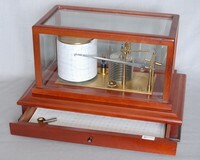 The mechanics of the instrument are identical to that of a normal Barometer. Manganin was used in the 1930's as a replacement for Nickel Silver used up until then. Manganin and Ureka wire was superceded by Nickel Copper and Nickel Chrome Alloys. Unit for measuring temperature from zero to 100 degrees centigrade. The knob is turned until the needle centres between increase and decrease. The temperature is read from the scale attached to the knob. 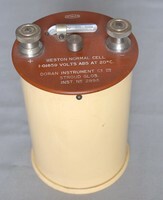 Standard voltage Cell for use with accurate measuring equipment such as the Wheatstone Bridge. Edward Weston (May 9, 1850 � August 20, 1936) was an English chemist noted for his achievements in electroplating and his development of the electrochemical cell, named the Weston cell, for the voltage standard. Edward Weston was a competitor of Thomas Edison in the early days of electricity generation and distribution. 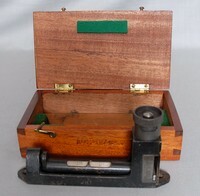 Weston' son Edward Faraday Weston also received several patents regarding exposure meters. 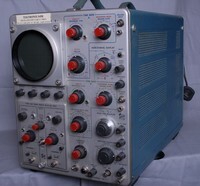 Used in exchanges for testing equipment. 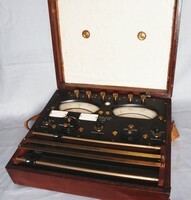 Galvanometer unit for use with other test gear. May have originally come from Dollis Hill Laboratories. And may have been made by H.W.Sullivan Ltd in 1954. 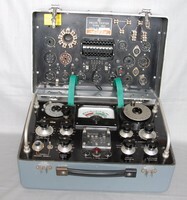 This piece of equipment is in excellent condition and may have come from Dollis Hill Laboratories. This too may have come from the Dollis Hill Laboratories. Originally may have come from Dollis Hill Laboratories. 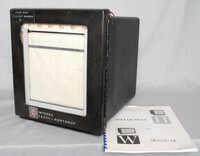 Valve chart recorder, for measuring and recording on paper information collected by sensors sensitive to voltage or current readings, meaning it could record almost any equipment with a sensor attached to it. Resistance Bridge (Collins Patent) with pots normally containing a liquid, using pegs, which when dipped, creates a switch. Messrs Calendar and Griffith invented their Bridge in 1878, it went on to be used well into the 1930's. Used by G.P.O. engineers as a reference for resistance measurement. 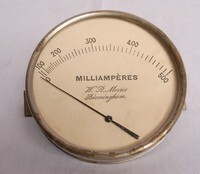 Modern example of air pressure measuring instrument in original style case. 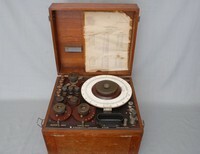 Direct Current measuring device used for accurate measurement of voltages. all voltage measurements are referenced from a 'Standard Cell' similar to Item A0333. Used by aerial cable engineers, such as the Post Office for telephone and telegraph lines, for tensioning the cable correctly. Used by engineers for checking gradients on structures. For measuring high voltages, probably a TV tubes high tension, the probe on the left is held on the voltage output to be tested, after the lead is connected to ground. By adjusting the knob on the right the distance between the two balls is reduced untill the voltage sparks accross the gap, the voltage is then read from the scale. War Department Wheatstone Bridge for the accurate measurement of resistance. Similar to the Post Office standard Wheatstone Bridge. Together with a Galvanometer and a standard voltage cell Like Item A0333, clipped into the pillars on the right of the instrument, accurate readings of long lines could be measured. Can be been wired in a bridge configuration. 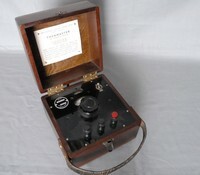 Bridge and insulation tester used in telephone and telegraphy workshops. A battery operated resistance meter operated in a bridge configuration i,e, with three known resistance it is possible to identify the missing section of the circuit when all components are connected in a circle or bridge configuration. Sets like this were made by many manufacturers in the UK before mass production from Japan and China took over. 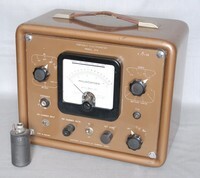 Laboratory Volt meter with valve amplification providing a very high input resistance. Megger instrument for measuring very high resistances (leakages), using high voltages created by winding the handle on the end. Used by the GPO on Telephone lines. 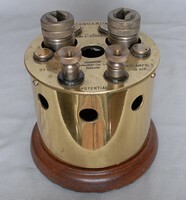 Surveyors compass's, which have a needle with small sideways movements and few degree marks. Designed to be small and portable, would be used with maps on site. 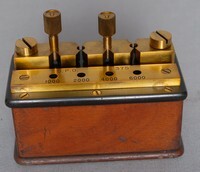 Also called a Gaussmeter, after Carl Friedrich Gauss in 1833. It measures the direction and strength of magnetic fields in the vicinity of other affecting objects. The earth's magnetic field (the Magnetosphere) varies due to influences of rocks and ores in the ground or the interaction between particles from the sun affecting the Magnetosphere. 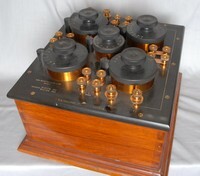 This is an early instrument for measuring these effects. It could be mounted on a long rod and slid along taking readings at precise intervals. Patents 16799 15th July 1914 and 24056 15th Dec 1914 accredited this item to Alexander William Sharman, holder of 40 other electrical and scientific patents. A transformer like search probe for locating breaks in metal pipes and cables which would be connected to the oscillator output (red lead) while the negative lead is connected to a metal stake which is driven into the ground to provide a return circuit. Headphones can be connected to the search probe or to the accessory search coil.